Win a FREE Fender Brad Paisley Road Worn Telecaster Guitar! It’s not often that we share contests here that are not our own, but when we saw this one come across our desk we KNEW we couldn’t leave our loyal readers out of it! 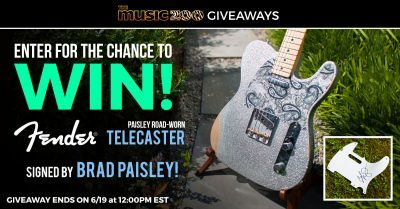 Our friends at The Music Zoo are giving away a FREE Fender Brad Paisley Road Worn Telecaster, signed by Brad himself! Click the image below or this link to enter, and good luck to all of you! This is the brand new Brad Paisley Road Worn Tele from Fender. A unique guitar for the Country music superstar, this Tele is unique with its body that has a pawlonia core with spruce top and back that make the guitar incredibly lightweight, with an enhanced “V” neck profile to the maple neck, a ’64 Tele bridge pickup wound to Brad’s preferences, a Twisted Tele neck pickup, and 9.5” radius with modern medium jumbo frets! A great guitar with standout looks thanks to the silver sparkle finish and matching black and silver paisley pickguard. Entry only requires email address. See complete rules here. Country Music News Blog participates in advertising programs that help fund the operation of this site. For more information please visit our privacy statement. This entry was posted in Brad Paisley, Contests by Shauna "WhiskeyChick" Castorena. Bookmark the permalink.